Peterborough Sports predictably booked their place in the Under 15 PFA Cup semi-finals on Sunday to keep their hopes of a trophy treble alive. But the Division One table-toppers once again had to produce their best form to see off gutsy Gunthorpe Harriers Navy. The two teams clashed in a League Cup quarter-final the previous weekend and on that occasion Sports just managed to edge through 5-4 after extra-time. It was a similar story in the PFA Cup with Sports, who were the all-conquering Wasps Under 14 team last season, winning another tight contest by a single goal. It was 2-1 this time with Jazleigh Fife and George Warrington scoring for Sports and Zach Findley on target for Gunthorpe. Gunthorpe Sky, who play in Division Three, were also in PFA Cup quarter-final action. They lost 6-2 to Division One boys Peterborough Northern Star, who had Harvey Neale (2), Cameron Long, Will Palmer, Luca Zirpolo and Alex Roe on target. 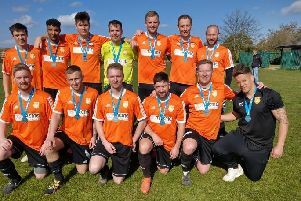 In the other quarter-final played on Sunday, extra-time was needed before Glinton and Northborough Amber from Division One advanced at the expense of Division Two side Stamford. Glinton won it 4-3 through goals by Andrew Irvine (2) and Owen Thomas (2) while Rory Guille, Brandon Williams and Callum Noble netted for Stamford. Leverington are the other semi-finalists. They beat Langtoft 2-1 earlier in the month. In the Under 18 PFA Cup, only one quarter-final survived. That was between Bourne Town Red from Division One and Netherton Blue Jays from Division Two and it was the higher level team that came out on top 3-0. Their scorers were Lui Tompsett (2) and Benjamin Moss with Jose Cordero-Rivera scoring for Netherton. Deeping Rangers, as expected, took their place in the last four of the Under 16 League Cup. The Division One title favourites beat Northern Star Red from Division Two 8-0 with Lewis Brady and James Pam both bagging a brace. In the Under 16 Northants Cup, Northern Star Blue made it through to the semi-finals by winning 4-2 at Wootton St George thanks to goals by Matthew Jones-Molyneux, Jordan Giddings, Oliver Foster and Oluwasegun Okunrinboye.